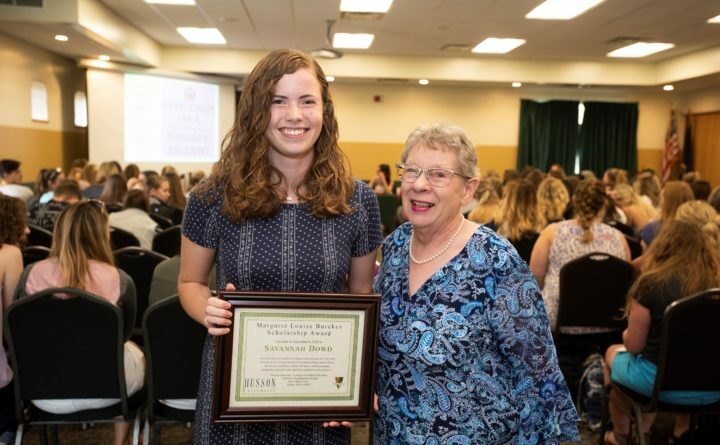 BANGOR — Husson University has announced that Savannah Paige Dowd, a fifth-year student pursuing her Master of Science in occupational therapy, is this year’s recipient of the Margaret Louise Burckes Scholarship. The scholarship presentation took place at the Richard E. Dyke Center for Family Business on Thursday, Sept. 6. Each year, the Burckes Scholarship is given to a Husson student, in good academic standing, who demonstrates a commitment to service and occupational therapy as a profession. Financial need is also taken into consideration. Recipients are selected by faculty members in Husson University’s School of Occupational Therapy. An outstanding student, Dowd began her studies at Husson in 2013. She was named to the Honors List in 2016 and the Dean’s List in 2017. Dowd grew up in Smithfield, Rhode Island and graduated high school from the Metropolitan Regional Career Technical Center in Providence. The scholarship is made possible through the generosity of Margaret Louise Burckes. Burckes career afforded her the opportunity to work in rehabilitation hospitals, nursing homes, and in homecare services with people who had both mental and physical disabilities. Over the course of her career, Burckes travelled to fifteen countries, including Singapore and Thailand, in order to serve populations in need of occupational therapy (OT) services. Prior to her work in OT, Burckes taught high school biology in Massachusetts and Connecticut. She has lived most of her life in New England and New York State. Burckes strongly supports the work of Compassion International and has sponsored numerous children through this organization. In addition to travel, she enjoys camping, hiking, gardening, photography and is a lover of animals. Like Margaret Burkes, Savannah Dowd has traveled to other countries to help others. In the summer of 2016, Dowd went to Albania for two months. “She was clearly very committed to volunteer work and made the decision to go even though it required her to make some personal sacrifices,” said Laurie Mouradian, ScD, ATR, OTR/L, professor and chair of the School of Occupational Therapy at Husson University. “The fact that Savannah has been able to engage in volunteer work, maintain good grades as a fulltime student, while also working part-time is very impressive. She plans to continue her volunteer work in the coming year. Savannah has also expressed an interest in becoming a tutor/mentor for incoming students. She’s eager to share her experience, insight and support with her peers and wants to help them adjust to the challenges of the professional phase of OT education. Savannah is truly deserving of this honor,” said Mouradian. The Margaret Louise Burckes Scholarship is just one part of a financial assistance tapestry that Husson University makes available to students. Despite being the least expensive four-year private college in New England, according to an analysis by U.S. News & World Report, over 95 percent of Husson students qualify to receive federal, state, community and/or campus-based financial aid or scholarships. Last year, the university awarded nearly $14 million in institutional-funded grants and scholarships to students. Husson University’s School of Occupational Therapy is one of the best sources of professional healthcare education in Maine. In 2017, 100 percent of new Husson occupational therapy graduates passed the National Board for Certification in Occupational Therapy (NBCOT) exam within one year of graduation. The field of occupational therapy is a dynamic, growing healthcare profession that helps people maintain, or regain, the ability to participate in tasks associated with daily living. This can include a variety of activities affecting work, play, self-care, or caring for others. Occupational therapists work with people of all ages in a range of settings such as their homes, the community, hospitals and schools. They help people enjoy life to its fullest. Occupational therapists accomplish this by utilizing creativity, flexibility and problem-solving skills to help people find practical real-life solutions to the challenges they’re facing. For more information about Husson University’s occupational therapy program visit http://www.husson.edu/college-of-health-and-education/school-of-occupational-therapy/.